Bringing together the most intricate and exquisite of designs, our Victorian switch plate showcases an elegantly-detailed border, offering a distinct look to your home. This collection is pure old world vogue and is a period reproduction based on Yale & Town’s original Largo design from the early 1900s. 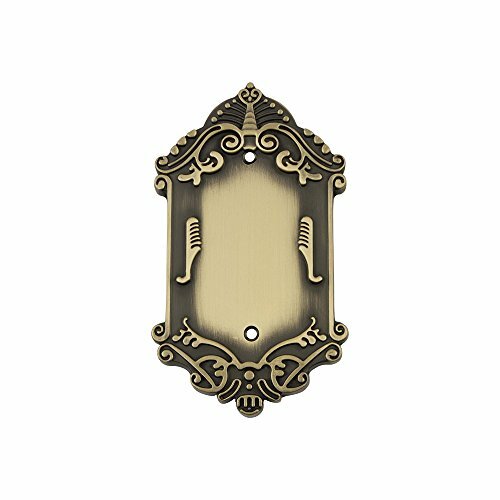 With an Antique Brass finish you can add a beautiful, yet soft look to your switch plates. This finish is polished and hand-relieved, highlighting the brass material, which is secured with our satin lacquer. Available in a variety of configuration options including: 1 Toggle, 2 Toggle, 3 Toggle, 1 Duplex (Socket), Double Duplex (Socket), 1 Toggle / 1 Duplex (Socket), 1 Duplex (Socket) / 1 Rocker, 1 Rocker, 2 Rocker, 3 Rocker, 1 Toggle / 1 Rocker and Blank. If you have any questions about this product by Nostalgic Warehouse, contact us by completing and submitting the form below. If you are looking for a specif part number, please include it with your message.